Our Exhibit Network I&D team wear shirts that say: relax…we got this. Let us explain. Too often exhibitors overlook the main purpose for being in a tradeshow – to meet people and make a good first impression! They think they have to do everything themselves, and in doing so, sabotage their main purpose. Does this describe you? 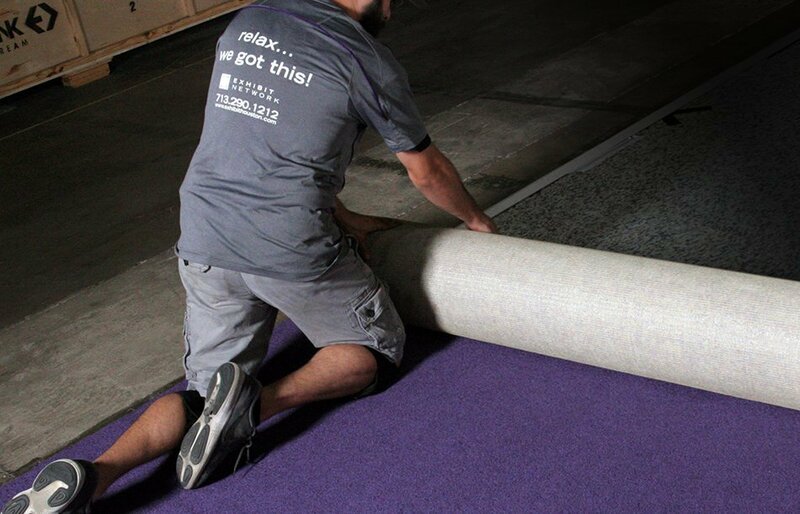 The showfloor is hot and humid, and you have been to the show contractor’s desk two times to check on your carpet. Finally, the carpet arrives and is installed. It’s not the exact color you thought you ordered, but whatever; it is carpet, and it’s in your booth space. You notice the booth space across the aisle is still empty. There’s nothing in it at all except a 6’ table and two chairs. You begin to open your exhibit cases and pull out the necessary pieces to set up your booth. The last person who set up the exhibit didn’t exactly repack it the way you would have, so it takes a little extra time to get situated. You use the empty 6’ table across the aisle to sort the pieces. It’s not so bad because soon you have all the pieces laid out and in the order you want them. You notice a professional I&D crew arrives across the aisle. They ask if these are your exhibit properties in their booth space. “Oh, sorry,” you say. “No problem,” they reply and move the table to the center of the aisle. After you finish hanging your graphics on your exhibit (for the third time!) and they are perfectly aligned, you begin to set up your case-to-counter conversion with your logo on front. Everything is going smoothly, well, smoother than last time. By the time you unpack your candy dish and business card holders, you look across the aisle and see no one! The booth across the aisle is done – including carpet, exhibit, lights, counter, and accessories. The cases have EMPTY labels on them, and the 6’ table and two chairs are nowhere in sight. How, you wonder, did they finish so fast? You, too, finish your booth and place EMPTY labels on your cases. Finally, you can go to Happy Hour. There’s just one thing. You’re all hot and sweaty and forgot to bring a change of clothes. Your honest friends would say you’re a mess! What will everyone at Happy Hour think? At the last minute, you decide to skip Happy Hour because you know it’s better to make no impression than a bad impression. Hopefully, this doesn’t describe you at all. But we’ve seen it all too often, and that’s why our T-Shirts say: relax…we got this. True, a professional I&D crew costs money, but what does it cost you to miss Happy Hour and the opportunity to meet people? Call Exhibit Network today for your next trade show install – 713-290-1212.